The sphere that stood in front of the towers is now standing with an eternal flame. It's probably just me, but when I look at it, I see an upturned face with its mouth open in shock. Fitting. 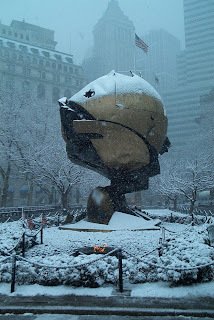 I remember sitting around the fountain in the plaza looking at this sphere. I couldn't believe it survived. So much just disappeared that day.